Shiso, also known as perilla, is a great herb to use in cocktails. This martini combines shiso and cucumber. This bold and herbaceous cocktail I created will quench your thirst. And exactly how I concocted it is just as interesting as the history of the main ingredient – shiso. Plus, discover how one of Seattle’s famous chefs, Thierry Rautureau, uses shiso in his kitchen. After a brief, but much-needed vacation, The Solo Cook is back, filing you in on the best recipes and hot spots to visit. Don’t think for a second that while I was taking time off I wasn’t thinking of you. While I may have been entertaining my dad and friend Jane, I was still thinking of ideas for gardening, cooking and enjoying food for all the single people out there. If anything, my time away, stimulated even more ideas. 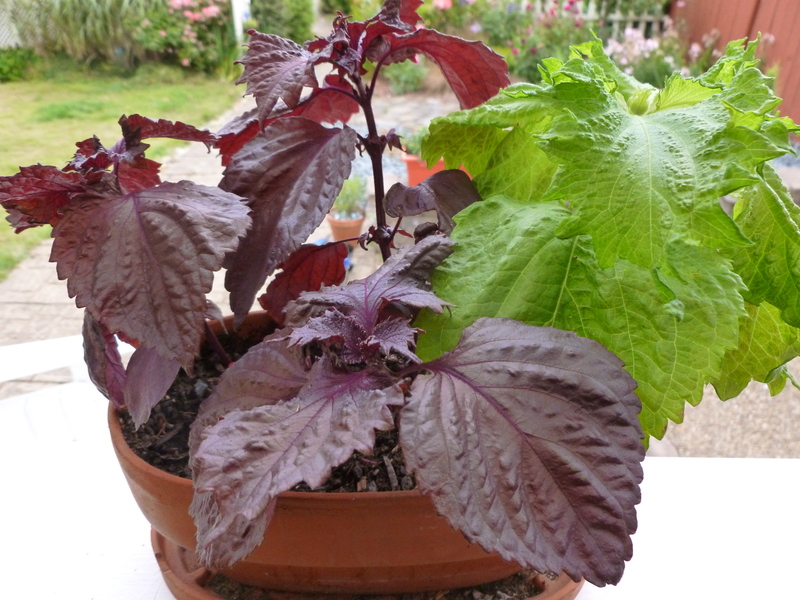 Shiso seeds can be bought at any nursery or garden store. Given my need for things that involve risk, I was committed to planting something other than traditional herbs and plants in my garden this year. In mid-June I bought shiso seeds and planted them in a little container on my deck. 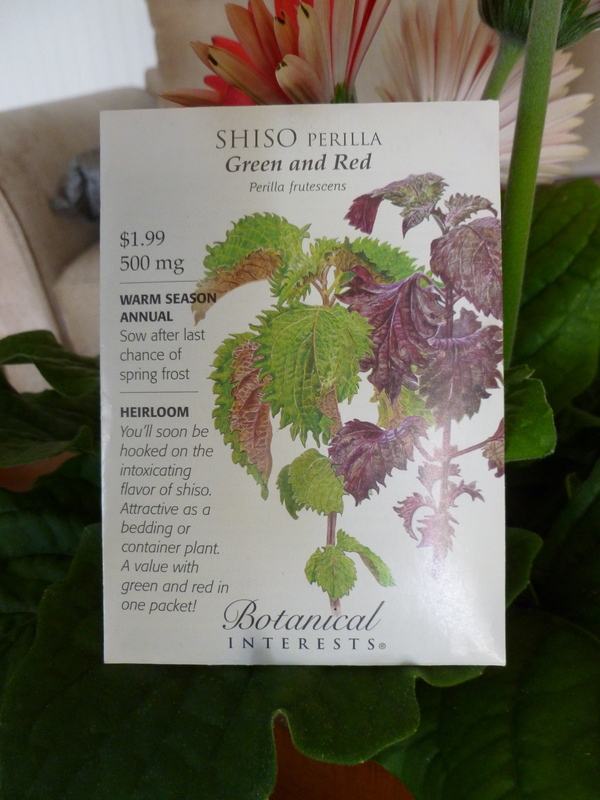 Weeks later, to my surprise, little red and green plants sprouted and my shiso, also known as perilla, appeared. This annual flourished in the small pot, but it never emerged from the relatively dry ground near my dahlias. So I recommend you plant the seeds directly in a container in early June, and once the plant is a few inches tall, start to harvest the leaves. If you lack a green thumb, don’t worry about growing shiso. The fresh leaves can be purchased at most Asian grocery stores. Plant red and green shiso in June. It also can be purchased in Asian markets and grocery stores. Shiso is a rich source of calcium and iron, and imparts subtle hints of clove, cinnamon and cumin. I decided to plant shiso, also known as Japanese basil, because I enjoy it with one of my favorite types of food – sushi. But don’t relegate this herb to just chopsticks. For some expert advice on shiso, I turned to James Beard Award-winning chef Thierry Rautureau, who owns Rover’s and Luc restaurants in Seattle. Rautureau, who competed on “Top Chef Masters” on Bravo TV, has been growing shiso for years, and has developed quite a liking for it. For a salad, he recommends combining shiso with watermelon, feta and lemon-olive oil dressing. In Asian folklore, shiso was a sacred herb that if disrespected or stepped on meant death, according to Botanical Interests, a seed company. Another factoid of interest is that in the U.S., shiso was a key ingredient in sarsaparilla and flavored dental products. For this blog, I usually create a food recipe perfect for one, but I thought it would be daring to concoct a drink with something from my garden. Be adventuresome and try this cocktail. At a minimum, I can guarantee it will be intoxicating. 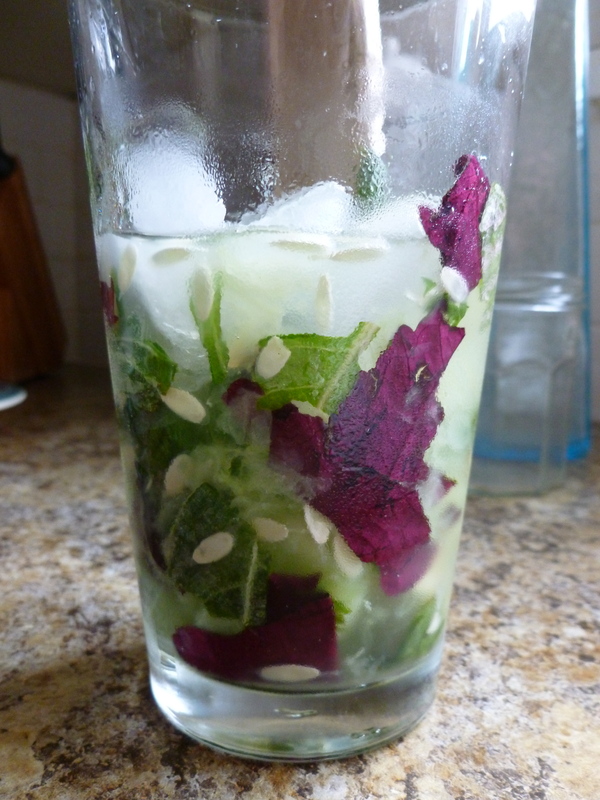 Muddle shiso leaves and cucumber. Tear shiso leaves apart and put in cocktail shaker or pint glass. Use the handle of wooden spoon (like mine from Ecuador) or a muddler to mash cucumber and shiso together. Add vodka and simple syrup and continue to muddle. Add ice to glass until half full, and shake or stir. 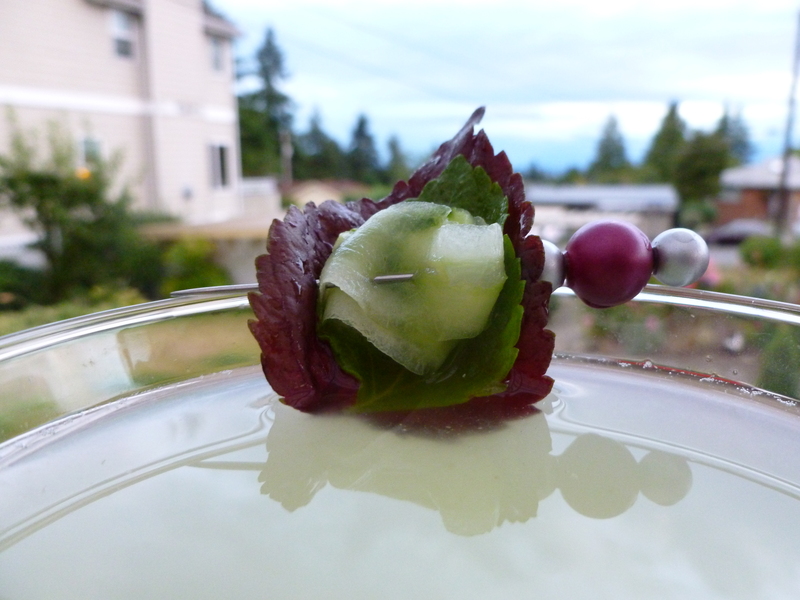 Garnish martini with cucumber slice and two shiso leaves. 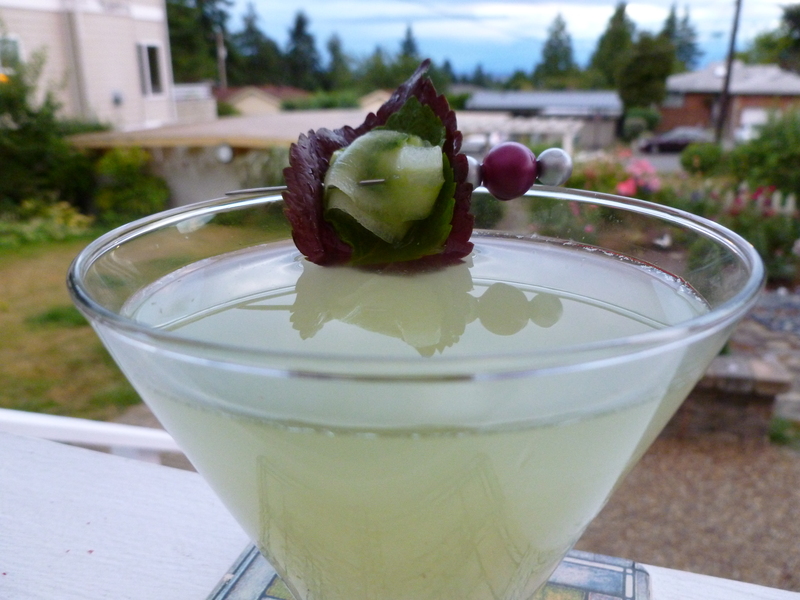 Strain ingredients into a martini glass and garnish with a red and green shiso leaf and a thin cucumber slice. * Simple syrup is a must-have when making cocktails and other drinks. Just bring to boil equal parts sugar and water together until dissolved. After cooling, syrup can be stored in refrigerator for several months. I usually make one cup. Posted in Recipes and tagged cocktail, cucumber, drink, garden, herb, martini, recipe, shiso, vodka. Bookmark the permalink.